The Hampshire County Arts Council fosters the creation, presentation, and enjoyment of the arts in our community. HCAC sees the arts as an integral part of daily life. An art-rich environment enhances the quality of life for residents and visitors and encourages the development, recognition, and appreciation of local performers, musicians, artists, and writers. Throughout the year the Hampshire County Arts Council presents numerous opportunities to enjoy and participate in the arts and supports other entities in their efforts to enrich our community. The Hampshire County Arts Council’s membership year runs from April 1 through March 31 each year, with all members due to renew in April. Renewal can be accomplished online (click here), or by check mailed to Hampshire County Arts Council, P.O. Box 624, Romney, WV 26757. The Romney Project’s plan to “Paint the Town” is off to a great start, thanks to a generous donation to their GoFundMe Campaign from Carol Shaw. The first mural, on B Belles’ east wall facing Celebration Park, was painted by volunteer artists. After “getting our feet wet” and showing the community how much difference some artistic design and paint can do to transform the looks of the town, we will be ready to tackle our more ambitious historical timeline of Romney mural. If you are interested in helping with future murals, contact Joanne Snead at joanne_snead@yahoo.com or 304-298-3039. A collaborative group of volunteers from the Hampshire County Arts Council (HCAC), the Town of Romney including the Mayor and the Town Administrator, and concerned and interested business owners and citizens has embarked on an adventure to use art and this history to showcase our town. Our collective love of art coupled with our interest in history led us to this extremely needed effort, namely The Romney Project (TRP) to raise awareness of our town’s rich history and culture and uplift the community spirit through arts and education. Romney—West Virginia’s oldest town (established December 23, 1762)— is a pearl in the Hampshire Highlands, waiting to be polished and shown to the world. Inspired by the successes of the arts-driven community awakenings around WV, we will be “painting the town.” Not red but with art and activities that will transform the perception of Romney visually, emotionally, passionately and affectionately. You can be a part of our plans and dreams. 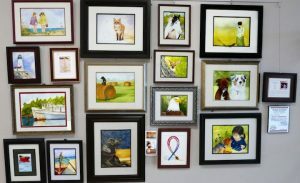 • MURALS: Multiple Romney business owners have granted permission for murals to be painted on their buildings. A variety of themes are planned depending on the location and the history of the location. 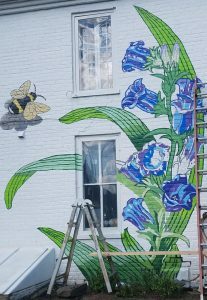 John D’Amico, HCAC member and professional commercial artist, along with other local artists, is designing the murals by working with the business owners and TRP members. 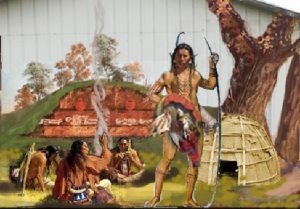 The signature mural, shown at top left, is a historical timeline of Romney from the early Indian settlements to today and has been proposed for a large building or to be used in parts on a series of buildings. Also shown at left are details of a section in the middle, and the design of the end of the mural showing some of what life is like today, and a design for one shop in Romney. The Hampshire County Arts Council sincerely thanks our faithful sponsors whose contributions allow us to offer the community many events each year. The Hampshire County Arts Council earns a penny every time you search the Internet using GoodSearch.com, a search engine (powered by Yahoo!) that donates half its revenue—about a penny per search—to the charities its users designate. Use as you would any search engine. Go to www.goodsearch.com and go to the “participating non-profits” and “West Virginia” list to find us as the charity you want to support. Just 50 of us searching four times a day will raise about $730 in a year without anyone spending a dime! Please try it out, and spread the word! HELP US SPREAD THE WORD!